Paul Powell was born in Vienna, Illinois on January 21, 1902. 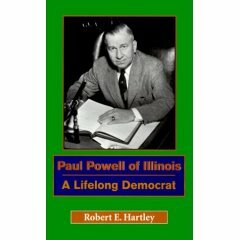 He was a big wheel in the Illinois Democratic Party since WWII. Eventually, he became Illinois Secretary of State during the same year I was born, 1965. In 1966, his office was investigated for corruption; he was exonerated, but his chief investigator was indicted for theft of state funds. 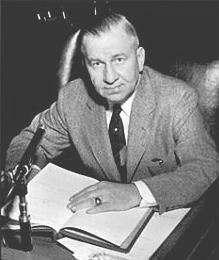 He was still in office when he died in Rochester, Minnesota on October 10, 1970. Shortly thereafter, a shoebox full of money was found in his room at the St. Nicholas Hotel here in Springfield—the infamous cache. The famous Paul Powell shoebox was actually more than one box, and not all were shoeboxes. There were also metal boxes, briefcases, and envelopes. This treasure trove—roughly $800,000 in cash—was discovered two days after he died, when Powell's staff and his estate executor gathered his belongings from the hotel room and storage area. The other, less famous findings included 49 cases of whiskey, 14 transistor radios, and two cases of creamed corn. This guy was prepared; for what, I don't know. "We just assume politics is corrupt and a little bit of corruption is the cost of doing business," said Kent Redfield, a political scientist at the University of Illinois at Springfield. That was certainly the attitude toward former Secretary of State Paul Powell, owner of the mysterious cash-stuffed shoeboxes. "Paul did a lot of good things for southern Illinois, including helping to build the university I work at," said Mike Lawrence, the director of the Paul Simon Public Policy Institute at Southern Illinois University in Carbondale. So when those shoeboxes were found in Powell's home when he died in 1970, it raised some eyebrows but not much ire. "People were surprised about the amount of money," Lawrence said of the cache that neither Powell nor anyone else ever explained. "But there was sort of a sense if he gave us our share, what's wrong with him getting his share." Powell never earned a state salary of more than $30,000 per year, yet in the last year of his life, his federal income tax return showed an income of more than $200,000. At his death his estate totaled $3.2 million, and, when settled in 1978, was worth $4.6 million, including nearly $1 million in racetrack stock. That's right: "Paul Powell". Now are you surprised he ended up with $800,000 in those shoeboxes? I completely agree with the above comment, the internet is with a doubt growing into the most important medium of communication across the globe and its due to sites like this that ideas are spreading so quickly. Today I found your blog, I checked carefully, and it was very interesting.I love him so much. I hope you are lucky that a lot of success. I have been a reader for a long time, but am a first time commenter. I just wanted to say that this has been / is my favorite update of yours! Keep up the good work and I'll keep on checking back.This is i'm in search of. Here is what I refer to as value. The details provided here should be to the most. I would like say you will require invested some time in showing every one of these satisfied jointly. only occasionally toilet trained, and she also had mild cerebral palsy. The Social Securite's not eligible for benefits because she's not in school (we homeschool) and we own too much property (we inherited a very rundown family farm. This was very informative. I have been reading your blog a lot over the past few days and it has earned a place in my bookmarks. It is wonderful.I learn a lot from it.thanks for sharing the article. I feel pleasure to visit here. Its really Informative and appropriating Post. I read completely and try to understand all points. although they all are in simple words. Your website is very interesting. I liked your website a lot. The post is pretty interesting. I really never thought I could have a good read by this time until I found out this site. I am grateful for the information given. Thank you for being so generous enough to have shared your knowledge with us. One acknowledges that humen's life is not very cheap, but we need cash for different issues and not every one earns big sums cash. So to get fast loan and small business loan should be a correct solution. Ah! The world is not good. Writing an exact man,i admire you. Good luck with the site I like the way you react to my special nationalism Nice joke! Where does a one-armed man shop? At a second hand store.